As many of you know, I make the kids Halloween costumes every year and E goes to a school where they dress up as literary or historical figures/characters in homemade costumes. 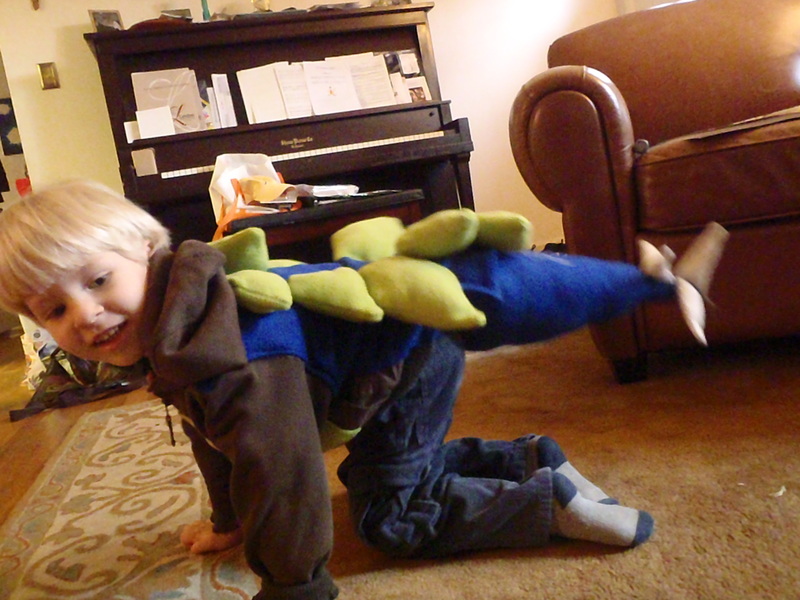 H had been dressing up in the dinosaur costumes that I had made for E when he was 3 and 4 and he had determined that was what he was going to be. So, H was done. Woo! At first E wanted to be George Washington. So I bought some really awesome heavy wool and some beige linen to recreate his general’s uniform. I was excited to start patterning. And then, on a routine trip to the doctor, he informed Dr. W that he was going to be Boromir. “You know. From Lord of the Rings.” To which the doctor, with a puzzled expression on his face said, “I know. I’m just surprised you know.” And replied, “Well, it’s a book.” As if that explained everything. So, back to the fabric store I went. I found some sparkly fabric that resembled armor of some kind, a brown velour that resembled a kind of fur/leather kind of thing, a neat clasp, and some other fabric that looked more like a dark brown leather for his boots. And as I commandeered the dining room table and spread the fabrics out I was getting excited. 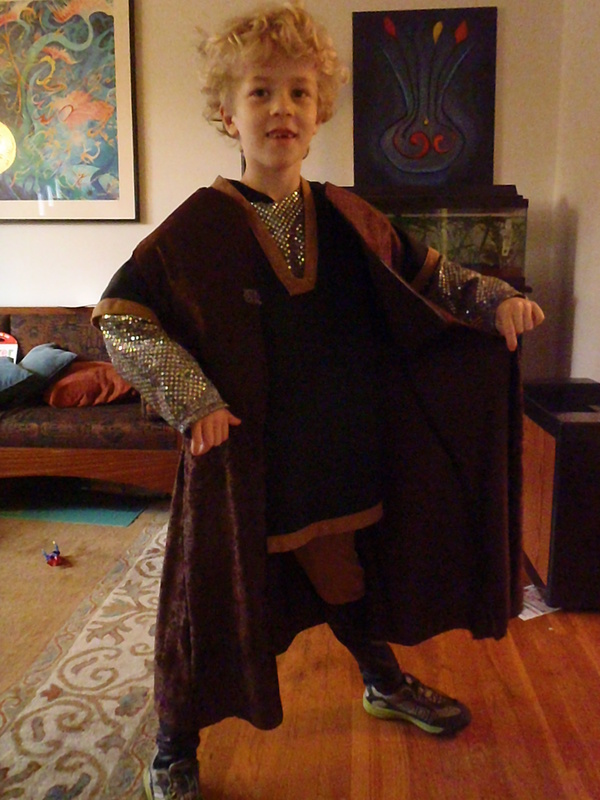 My son was going to be a Lord of Gondor. 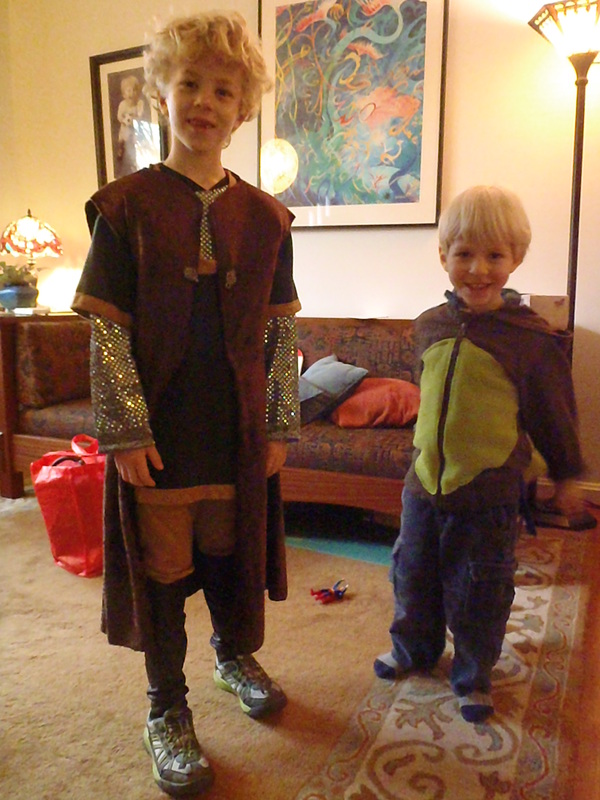 And I kind of cheated – or was incredibly thrifty- and used the basic tunic and pants I had sewn last year for his Robin Hood costume as the base for Boromir. 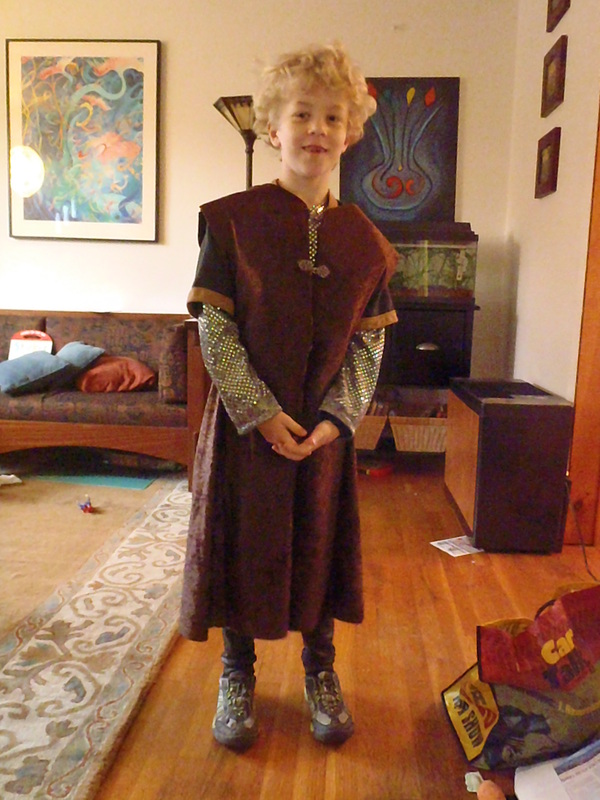 And after sewing all those costumes last year for E’s musical, sewing a chainmail tunic was a piece of cake. The fake boots were a good experience in re-learning how to work with elastic. After making about 3 critical errors with the elastic I finally figured out how to use 3-inch wide elastic at the top to make sure they didn’t fall down to his ankles without cutting off circulation to his lower limbs. Then I sewed down the back and left a gap of about 2 or 3 inches at the top so they would fit over his feet, but still tapper down his legs to his ankles and allow him to wear his usual shoes while having the look of Boromir’s tall boots. The cape/cloak went together surprisingly easy. Until I realized I was going to have to sew in interfacing and lining into the top to give it more structure. Ugh. BUT this is why I use pattern paper! I took the pattern I’d created for the cloak and used the top part for some lining and medium to heavy weight interfacing. And it worked! I ironed the interfacing to the lining and sewed it into the inside of the top and it gave great structure! You can see the great shape it gives E’s shoulders. 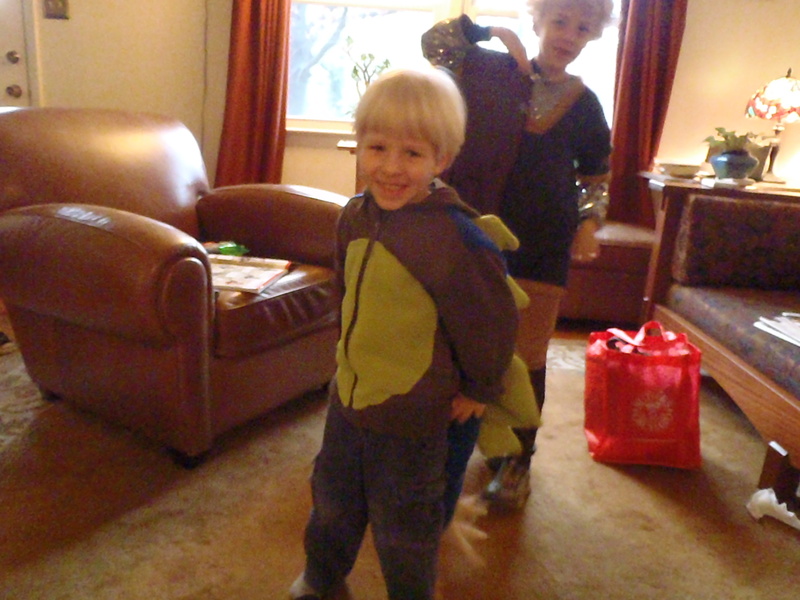 Boromir and his pet dinosaur. Great costumes. Does your blog have a new look? I like it.